Designed for making tubular woven fabric cloth by PP/HDPE flat yarn and its working range from 350-850mm(200-850mm by special request). Equipped with inverter for main driving motor and weft bobbin sensor for ensuring fine quality woven products. Gusseting device. center unfold device, both sides heat slitting device,ultrasonic slitting device, warp infeed motor and HMi contorl can be suppiled as per customer requiement. The machine runs with four shuttles to perform tubular weaving at speed up to 360 picks per minute(90 RPM), providing considerable productivity up to 100 m/hour. Equipped with frequency inverter for circular loom speed adjustment; pre-stop weft bobbin sensor before weft tape goes empty. 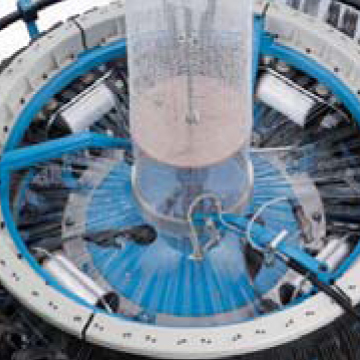 Upon warp and weft run-out/breakage, the machine stops automatically. Lubrication-free for cam and shuttle for less energy consumption. It is an advanced circular loom specially designed to meet the stringent productivity requirements in the present days. Interchangeable with flat weaving in demand with/without lamination and printing.